Cambodia is known as the land of Mystery, a unique destination rich in diversity and cultural heritage. Since the fall of the Khmer Rouge there is a new era of peace and stability in Cambodia. Farming began in Cambodia in 2,300 BCE, mirroring the Thai civilisation they learned to use iron by 500 BCE. The Mekong gave life to Cambodia with the first civilisations appearing on the Mekong Delta. The Khmer kingdom even traded with the Chinese and by the 7th Century Cambodia was civilised, and about 100 years later the Khmer Empire was founded under Jayavarman II. The centre of the Kingdom was at Wat Phu which is actually southern Laos before the capital was moved to Angkor Wat in Siem Reap in the 12th Century. After several Khmer kings civil war and a war with the Chams from Vietnam the Khmer kingdom began to decline in the 13th Century. The Thais captured Angkor in 1431 and soon afterwards the new capital was formed in Phnom Penh with Angkor being lost to the jungle before being discovered again centuries later. With the Europeans expanding their colonial rule in the 19th century the Khmer king turned to the French for protection against the Thais and Vietnamese and Cambodia became a French Protectorate in 1863. Under the French roads and railways were developed and in the 1920s a rubber industry grew up. However the Cambodians were forced to pay heavy taxes and from the 1930s Cambodian nationalism grew before being occupied by the Japanese in 1941 till the French Returned after the 2nd World War with Cambodia becoming independent in 1953 with a socialist government being formed under Sihanouk. A few years later at the end of the 1960s the communist party began a civil war and Sihanouk left Cambodia, with Cambodia renamed the Khmer Republic. Cambodia then fell to the Khmer Rouge in 1975 led by Pol Pot. During Pol Pot’s reign of terror the cities were emptied and the people were forced to work in the countryside in communal farming. There was little to eat with the rice being exported to China to buy weapons and between 1.5m – 3m people were killed or died due to the regime. Religion, education and even family life were banned and any infringements resulted in execution. The start reality of this can be seen at the Choeung Ek killing fields and Tuol Sleng Museum a former high school turned into a torture centre known as S-21 during the Khmer Rouge Reign. The regime went so far that intellectuals were executed even if you wore glasses you considered to be educated and were executed! After several skirmishes between the Khmer Rouge and the Vietnamese in the Mekong Delta area the Vietnamese invaded Cambodia and quickly defeated the Khmer Rouge in 1979 although they took refuge in the Thai Border area where Pol Pot lived till he died in 1998. Cambodia is now peaceful a poor country but that with a rapidly growing economy with tourism also an important industry. Cambodian people are friendly, polite and courteous, please be polite back. The main religion is Buddhism, with most of the country’s population being ethnic Cambodian, averaging between 90-95% of the total population making Cambodia the most homogenous country in South-East Asia. The majority of the country lives in rural areas due to the emptying of the Cities during the Khmer Rouge period. The Cambodian have had one of the hardest ordeals and are getting themselves back on their feet. The first impression you get of the country when you come here is a country of happy, smiling people. In fact, people are generally speaking very hospitable and guest friendly but to understand Khmer culture one has to go much more into depth. The nation still suffers from the era of the Red Khmer and many contradictions in daily life become visible when you try to understand Khmer culture. To come to the more visible elements, you can find Angkor everywhere, Hotels, guesthouses, cigarettes, beer, actually even two beer brands, one written Angkor, the other one Anchor which makes clear how proud people are on this milestone of ancient history. For the older generation, the most important values in life are family, and religion. The family has a major importance, especially in rural areas different generations of one family live together under one roof and the duty to serve the family and to do everything for the family is far more distinctive compared to the achievement-oriented society in Western countries. At the moment, Cambodia is undergoing fast changes in many aspects of living but currently tradition still plays a major role in every part of the country. Visitors should keep this in mind since traditionalism plays a higher role than in neighbouring countries as Thailand or Vietnam. Do greet Cambodians as like they greet you. Handshakes and physical contact in public is not an accepted norm. Especially between a man to a women or vice versa. Do try local specialty such as Amok and Num Bachok. Do watch traditional and cultural dance shows which are available in various restaurants. Do visit a local market in the morning to experience a daily life of the local. Do ask for permission before taking photos of others. Do bargain when buying things. Bargaining can be an enjoyable experience in interacting with the locals. Do learn some words in Khmer such as “Hello” or “Thank you”. Do take off hat and shoes before entering a Khmer home and pagodas. Do take up the opportunity of staying with a Khmer family, a great way to experience the life-style of the locals. Do buy Khmer souvenirs before returning to your home country. Don’t hug and kiss in public. Don’t wear revealing clothes when entering temples or place of worship. Revealing thighs, shoulders or chest is frowned upon in public. Don’t purchase historical artifacts in Cambodia (its illegal). Buy only the replica ones. Don’t put books or reading materials where people sit. Don’t criticize or make negative comments about the Royal family. The Victory from Genocide Day celebrates the liberation of the Cambodian people from the genocidal grip of the Khmer Rouge - the word "liberation" somehow made ironic by the fact that this was only made possible by the invasion of the Khmer's traditional enemy, the Vietnamese. Government events and rallies are held on this day to commemorate the Khmer Rouge's victims. The date is dependent on the Lunar Cycle and commemorates the coming together of 1,250 monks from all locations and directions, to meet and be ordained by the Buddha. This event occurred seven months after the Buddha began his teaching. Vesaka Bochea is a single day that commemorates three events in the Buddha's life: his birth, enlightenment, and passing into Nirvana. On Vesaka Bochea, Buddhists offer prayers to the Buddha, and donate clothes and food to their local monks. The Royal Ploughing Ceremony is a religious ceremony marking the beginning of the rice-planting season in Cambodia. On this day, the King's representatives plough a field in Phnom Penh with sacred cows, then divine the coming season based on what foodstuffs the cows eat afterwards. This day marks the anniversary of Cambodia's independence from France in 1953. The celebrations are centred around the Independence Monument at the centre of Phnom Penh, where the King lights a victory fire in the presence of the country's politicians, generals, and diplomats. Visas are available for most nationalities on arrival and immigration are very efficient when arriving by air. Visas are valid for 30 Days for a fee of $20 USD and you will require one passport photo. 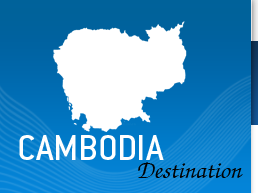 If you are looking to stay in Cambodia for a longer period it is advisable to obtain a Business Visa on arrival these cost $25 USD and can be extended up to a year or multiple times whereas a tourist Visa can only be extended once. The main cities are all equipped with an ATM and exchange and visa services make sure you have enough cash if you are heading to the quieter outpost towns. The local currency is the riel and is accepted anywhere as is US dollars. The largest note in everyday use is the 20,000 riel note, which is equal to about US$5. So it's a good idea to carry some US dollars and some real to pay for personal items during your trip. Electricity in Cambodia is 220 volts; this means for those arriving from the UK you will not need a Voltage adapter. You will probably need an adapter as most plugs in Thailand have 2 prongs missing the third grounding / earthing prong. This is starting to change with more awareness and better building standards though and many more places are starting to have the same 3 prong plugs as in the UK. Tipping is generally not expected in Cambodia. In some upper class restaurants or accommodations they will directly charge you with a 10% service charge, you should clearly see that on the bill. Feel free to leave a tip for good service of between 5-10 %, it is of course up to you and dependant on the service received. Guides are usually tipped $5 - 10 USD/day, and drivers about $2-5 again all dependant on the level of service received. You will need one passport sized photo to obtain your visa on arrival into Cambodia. If you don’t want to use roaming take a spare old phone sim cards are cheap in Cambodia and you can use them instead of being charged international roaming rates!